We're going to kick off this winter season with some serious good food and seriously great brews! We don't just serve beers, we explore the world through them. Come excite your taste buds as we select and pair great winter brews with our delicious guest favorite menu items and some limited time seasonal selections! Limited amount of room available. Call for more info. Come kickoff winter with us OC style! Our Certified Beer Experts will guide you through a 4 course meal. Each meal will be a pairing of one of our OC favorites with one of our select rotating craft beers. 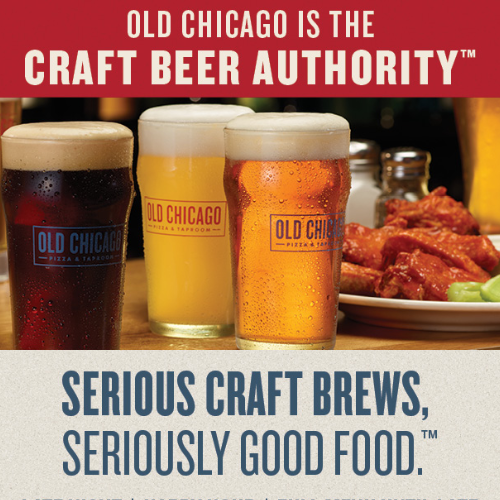 You will also receive a souvenir from Old Chicago and a goodie bag from some local breweries. Call us for more info.